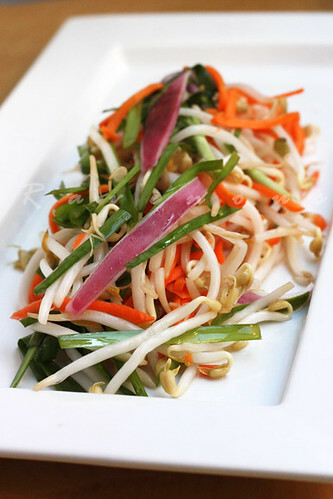 Pickled bean sprouts-dua gia (pronounced yua ya) is one of our favorite mon chua or pickled dishes. 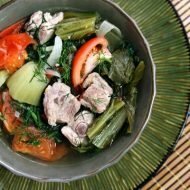 We love eating this with any type of hearty braised dishes such as thit kho (caramelized braised pork belly), ga kho (caramelized chicken), or ca kho (caramelized fish in clay pot) because it adds a crisp and tangy crunch contrasting the deep and sweet caramelized flavors. 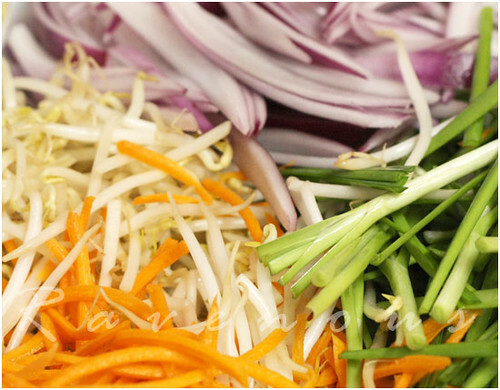 While the bean sprouts provides the crunch, the aroma comes from the chives or he, a key component of this dish. In plastic tupperware or similar container with a lid, combine the ingredients–filling with enough water and vinegar to cover. Season with bit of salt and sugar to cut down on the acidity. Close container and set in the refrigerator. 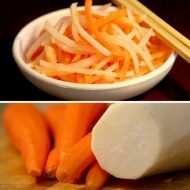 The pickled vegetables should be ready after 1 day and lasts for about 1 week. 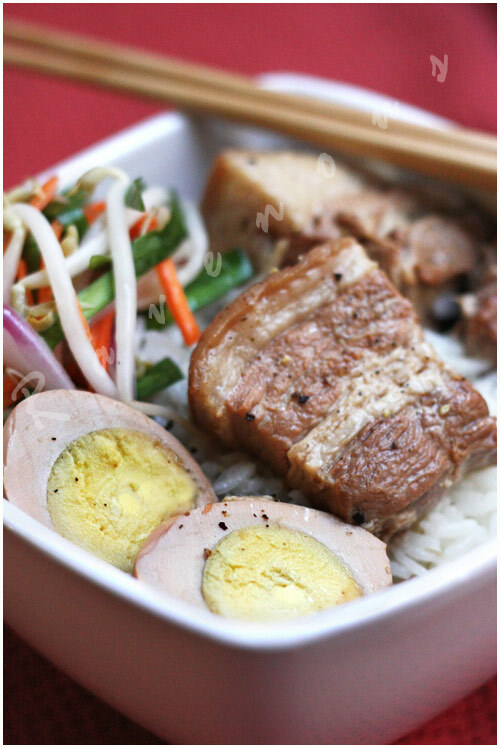 Dua gia is a great accompaniment to many dishes, but try it with our thit kho (caramelized braised pork belly) for a fantastic combination. 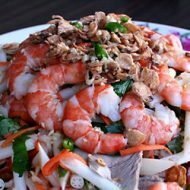 It’s a combination that many families in Vietnam often served during the Tet lunar new year. I like bean sprouts, plus I like food pickled. So, this sounds like it equates to something really tasty. Love side dishes like these! Pickled bean sprouts, oh yum! I think they go well with literally anything. Cafe Pasadena: It was nice to see you at the bakesale! Ju: We have to start keeping it in stock in the fridge because you're right–it goes well with almost any meat dish. So many possibilities with this colorful, light, side! These are fantastic. I could eat this with anything. Is this similar to the pickle vegetables served in banh mi? I mean the process how its made. Table Talk: Definitely light and tasty! Divina: We always fail to make enough when we do make this..it goes so quickly! KFP: You're right..the process is exactly the same..next time we'll try putting this in banh mi instead! I see pork belly!!! Woo hoo!!! Love belly. Oh yeah I do love teh quick pickle stuff too but I am still fascinated by belly. Looking for a way to use up an excess of bean sprouts, I stumbled upon this recipe and made it last night. So delicious!! I wish I had some sort of deli sandwich to eat with it. How come u don’t list how much sugar, salt, or vinegar to use? Bean sprouts recipe rocks! I added thin sliced red pepper and substitute scallions for chives, but I am sure there can be many variations. I also added some Sriracha, yum!